Home Acoustic Night with Chris Cayzer Chris Cayzer Chris Cayzer and Rocky Batara Chris Cayzer Gig Rocky and Chris Cayzer Rocky and Chris Cayzer Photos Rocky and Chris Cayzer VIdeo Chris Cayzer and Rocky Share Upcoming Gigs! 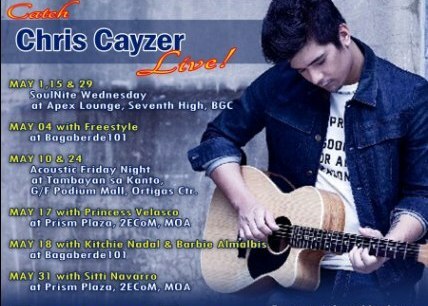 Chris Cayzer and I had a very successful gigs last April 2013. These include gigs in Tambayan Sa Kanto, 7TH High, Bagaberde 101, and Globe Tatt Awards 2013. This month of May, expect for more exciting gigs from this international heartthrob artist. Chris is 7TH High's opening salvo for the month of May. From May 1 to present, he had successful gigs together with the other stars like Barbie Almabis, Cookie Chua of Color It Red, Erik Santos, and Markki Stroem. I'll share with you all these gigs on my upcoming posts!